Back in September, Balenciaga presented its SS19 collection during PFW. For the show, artistic director Demna Gvasalia collaborated with visual artist Jon Rafman to create a set that felt like you were inside a computer, but IRL. Continuing to warp reality, the Parisian house has collaborated with digital artist Yilmaz Sen on a series of trippy campaign videos for its SS19 collection. 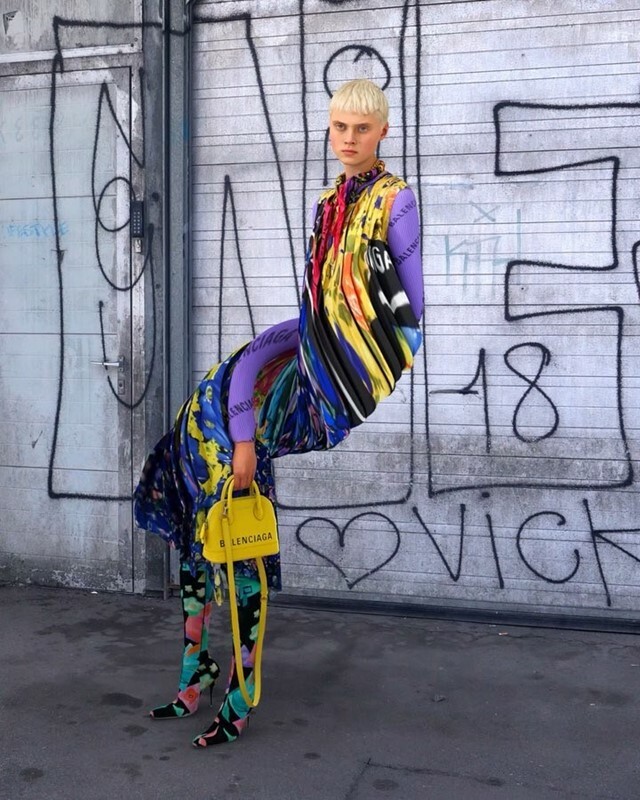 You’ve probably seen them all over Instagram, featuring Balenciaga-clad models rendered in 3D suddenly contorting into a variety of unnatural positions. It’s a weird flex, but we’re okay with it. “I wanted to explore human anatomy and imagine that something that isn’t possible in real life,” the artist tells us. “My intention was to show something unpleasant in a pleasant way and surprise people.” Given complete creative control by Balenciaga, Sen worked on the project solidly for a month, shooting with the house’s stylist Lotta Volkova and then working with a team in post-production to create the final animations. Here, we talk to the artist about the series and why we’re seeing a crossover with fashion and computer-generated art right now. How did you first get into visual art/digital design? Yilmaz Sen: I studied industrial product design at Mimar Sinan Fine Arts University in Istanbul where I’m from. The school was very traditional and I found out that product design was not my main interest so I started searching for what I’d like to do instead. I’ve always been interested in animation and motion design so I taught myself visual effects and how to create computer-generated images and that’s what I do now. Was it difficult trying to teach yourself those skills? Yilmaz Sen: It wasn’t that difficult, but I wasn’t really challenging myself at first because it was a hobby. I wasn’t really pushing my limits because I was at the beginning of the learning process. Over the past three years though it has been an intense learning curve, especially when I started working with industry professionals and they use a language I don’t understand. It became a little bit challenging, but over time I’ve gotten used to it. How did the project with Balenciaga come about? Were you familiar with the brand before? Yilmaz Sen: Yeah, I’ve been following and maybe somewhere deep down I thought that my work might be a good march for them, but I never thought they’d get in contact with me so it was a surprise. They reached out to me in the summer with some of my work that they liked but they let me do what I wanted to as if it was a personal project of mine. I came up with some concepts that were similar, but developed them a little so it would be different but not completely something else. What have the reactions been like to the images? Yilmaz Sen: I’ve been reading some of the comments and there are, of course, mixed reactions. Some people are outraged and say it doesn’t look like a proper fashion campaign. Other people are upset, but lots of people think it’s cool and funny so I’m happy with that. I wanted to create an extreme reaction, so I’m happy with all kinds of reactions I got from it. Why do you think some people respond negatively to them? Yilmaz Sen: I guess it’s because it’s unusual to create something that has no connection to reality. For the common audience this might be scary, or difficult for them to make a connection to it because you take something realistic and then it breaks apart to be weird, abstract, and unidentifiable. A CG artist can create a corner of hell if they wanted too, the possibilities are endless and sometimes you can easily let things get out of control. I see a lot of CG artists who are pushing extremes and it’s understandable that this might be too much for commercial brands or a common audience. For me, I was trying to find the balance between too extreme and too safe. Why do you think there has been a rise in the crossover between fashion and technology/digital art recently? Yilmaz Sen: It’s an unexplored area. For a long time, there have been lots of talented digital artists working for big directors, but since the software has become more widely available and there are lots of online tutorials, there aren’t so many constraints for artists and designers and they can explore more. Digital arts are beginning to open the doors of creating; everyone is able to create their own reality in computers. It’s exciting the amount of potential and I’ve already seen lots of CG artists working with more commercial brands. People might be afraid now because it’s weird and new, but I think eventually more companies will have the courage to work with digital artists because it’s new and fun.